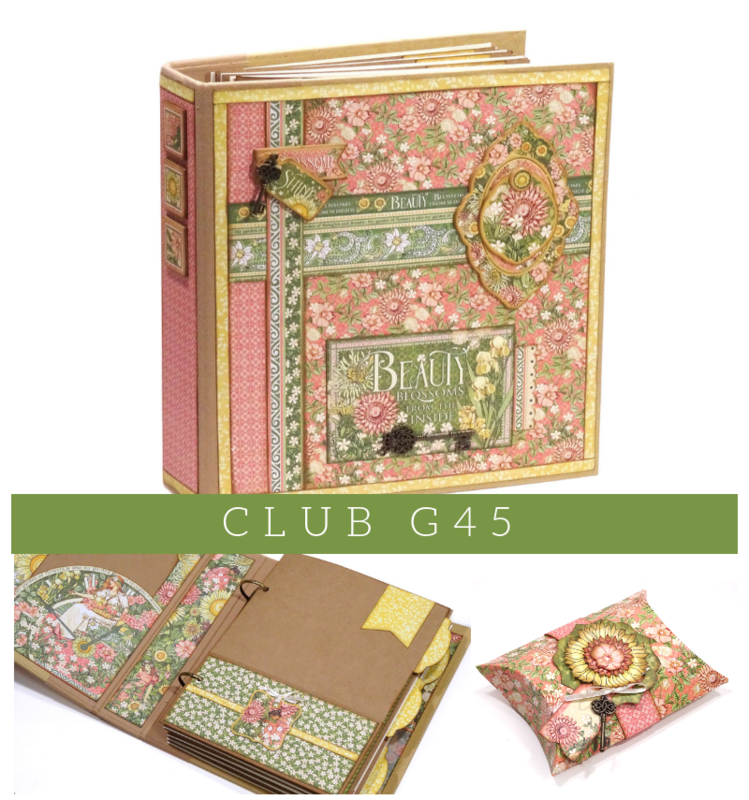 Create a beautiful Mixed Media Binder Album all wrapped up in Graphic 45’s stunning “Garden Goddess” collection. The album is designed with flexibility in mind… use it for photos & memorabilia of course, but it can also be used as a birthday & anniversary reminder, personal planner, photo album, dream journal, seed & garden planner, or as a stunning gift, just to name a few. You’ll learn fun paper crafting techniques as you create a circular pocket, vellum pouches, and large tags from the leftover pages. Plus, create a pretty little gift holder from the Pillow Box template on the back cover of the Garden Goddess pad. Use leftover paper scraps, a key, Tags & Pockets pieces, and ribbon to adorn. Good things come in small packages: Place a special treat inside, a gift card with a note, or even a piece of jewelry or a pretty scarf. The possibilities are endless! Your kit is LOADED with product, including: an 8×8 paper pad, 6×12 chipboard tag sheet, 6×12 tags & pockets sheet, a full pack of metal keys, 6×8 Mixed Media Album, plus full colour, detailed step-by-step instructions. Capture all your cherished holiday memories in this interactive and festive Christmas album. This project features a red Mixed Media Album (which is exclusive to this class! 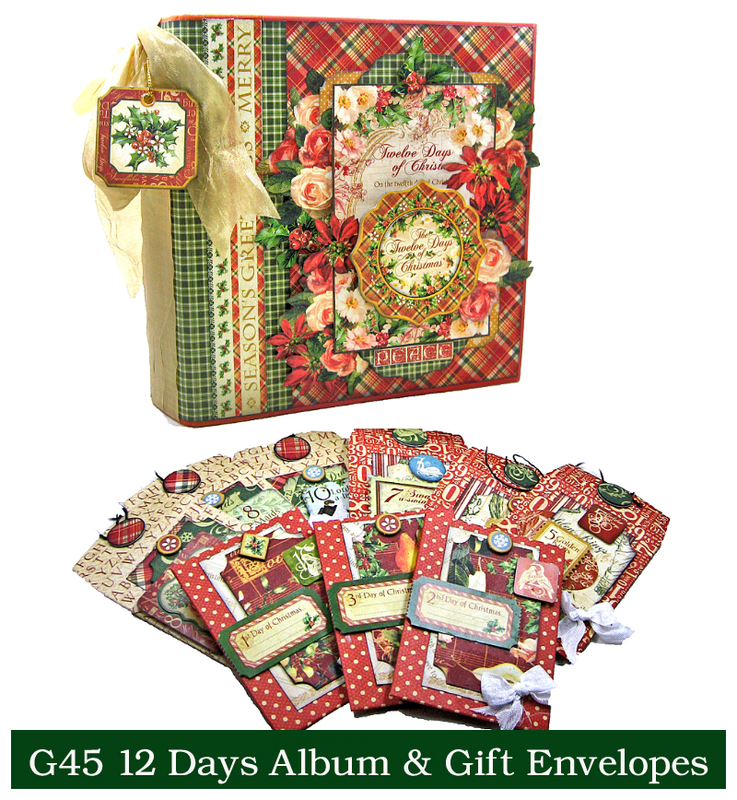 ), all decked out in Graphic 45’s beautiful Twelve Days of Christmas collection. The album is bursting with 40 pages full of quick and easy pockets, interactive page elements, elegant vellum overlay pages, and a beautifully layered and detailed album cover that you’ll proudly display in your home. Learn how useful product packaging can be, and how to transform ATC Policy Envelopes into stylish gift tags/gift card holders. Whether you’re documenting Christmas’ past or Christmas present, this album makes a stunning gift… whether for yourself or someone special on your Christmas list! 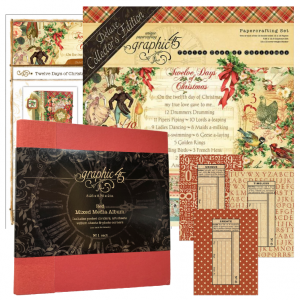 Your kit is LOADED with product, including: a 12 Days of Christmas Deluxe Collector’s Edition (24 12×12 paper, 6×12 chipboard & 12×12 sticker sheet), a 6×8 Mixed Media Album, a pack of policy envelopes, plus full colour, detailed step-by-step instructions. Light up your holiday home decor with a gorgeous Graphic 45 Christmas Magic lantern and coordinating accordion mini album. 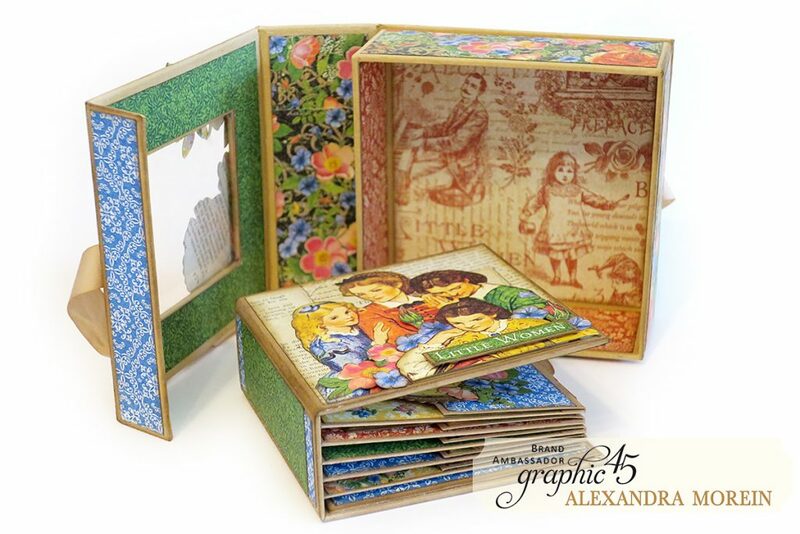 You will learn how to create a 3-dimensional box topper all wrapped up in Graphic 45’s classic vintage style, plus make an accordian fold tag album from scratch. The lantern base measures 8.5 x 6.5x 3.25 and we’re covering it inside & out with the beautiful Christmas Magic collection. This project makes a lovely gift too… if you can bear to part with it! So put on some Christmas tunes and let’s have some fun creating! 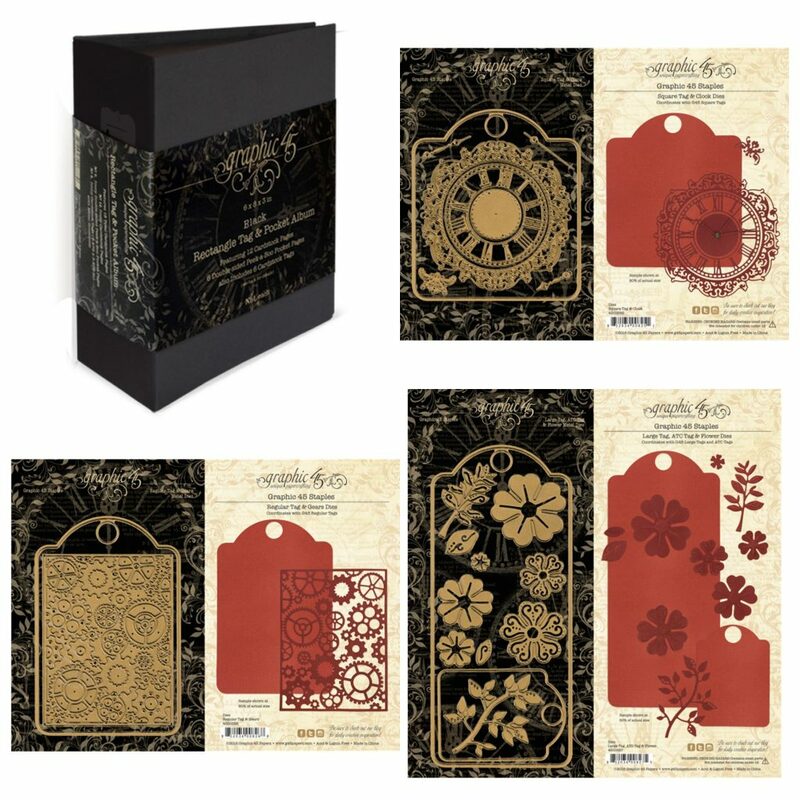 Your kit is LOADED with product, including: a Christmas Magic 12×12 paper pad (16 double-sided patterned papers), a 12×12 sticker sheet, a 6×12 chipboard tag sheet, a deep rectangular Matchbook Box, a pack of paper blooms, a pack of G45 Door Knobs & Plates, plus full colour, detailed step-by-step instructions. 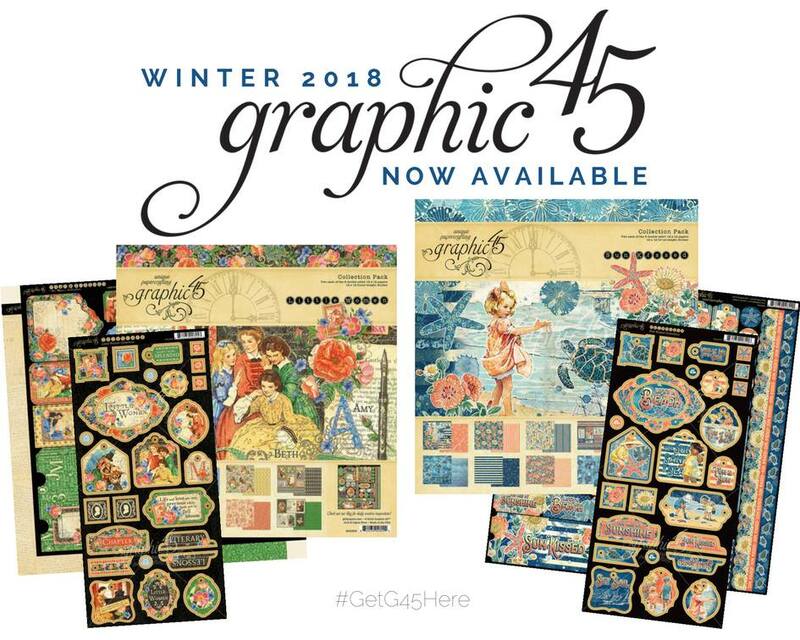 Create a special place for all of your favorite summer memories with Graphic 45’s Sunkissed collection! 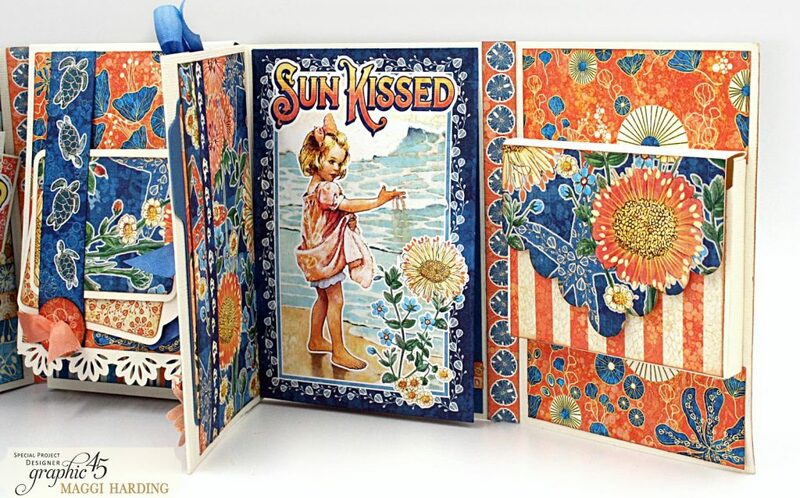 We’ll be decorating an Ivory Tag & Pocket album inside and out in the cheerful & nostalgic patterns of the Sun Kissed paper line. 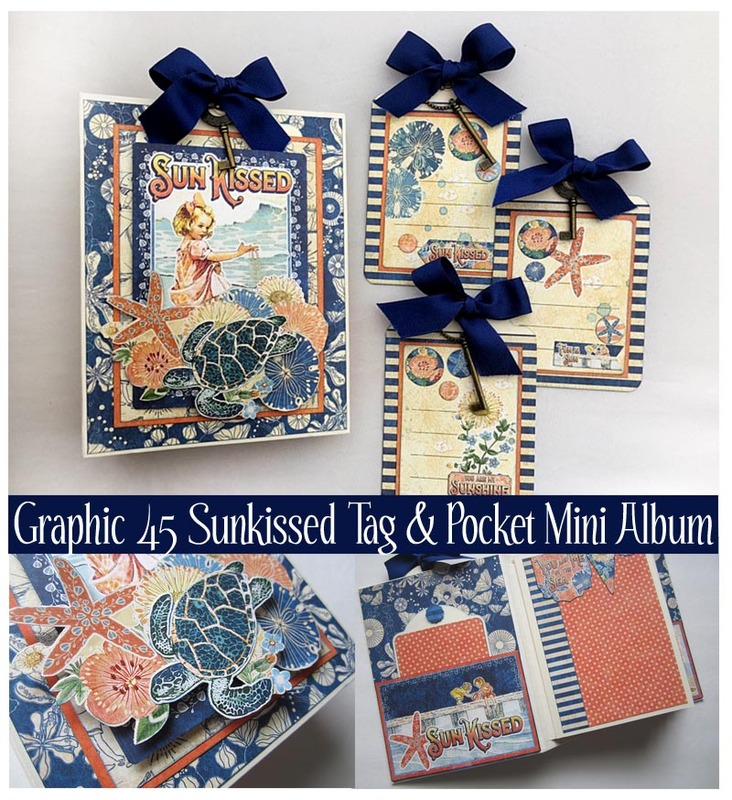 You’ll learn how to upcycle Graphic 45 packaging into your creation and you’ll get to create a charming gift tag trio too, with lots of leftovers to customize your album or create even more! This beautiful mini album is loaded with photo & journaling spots, oodles of pockets and fun summer imagery. Sea turtles, sand dollars, starfish, deep sea blues and vivid coral hues are the perfect backdrop for your summer & vacation memories! Your kit is LOADED with product, including: A 6×8 Album, a full Sun Kissed 12×12 paper pad (16 double-sided patterned papers), a pack of Ephemera Cards, a pack of Tags & Banners, a pack of G45 Clock Keys, a G45 Decades Ink Pad, ribbons, plus full colour, detailed step-by-step instructions. 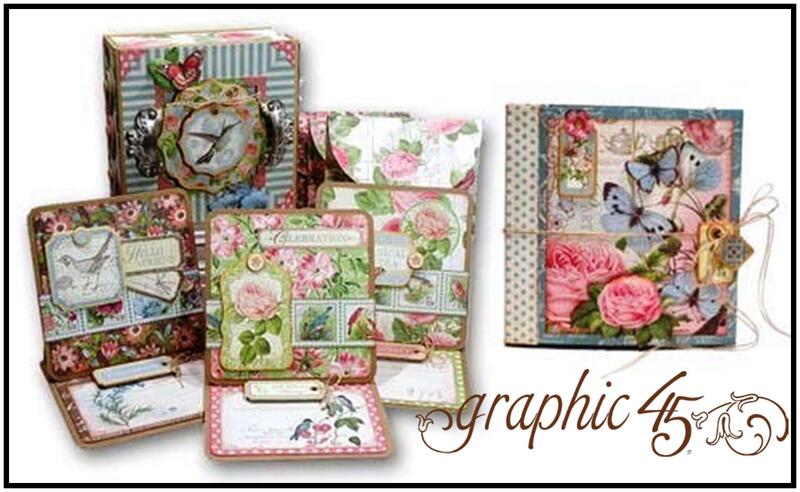 Let your creativity burst into full bloom with Graphic 45’s gorgeous Floral Shoppe collection! 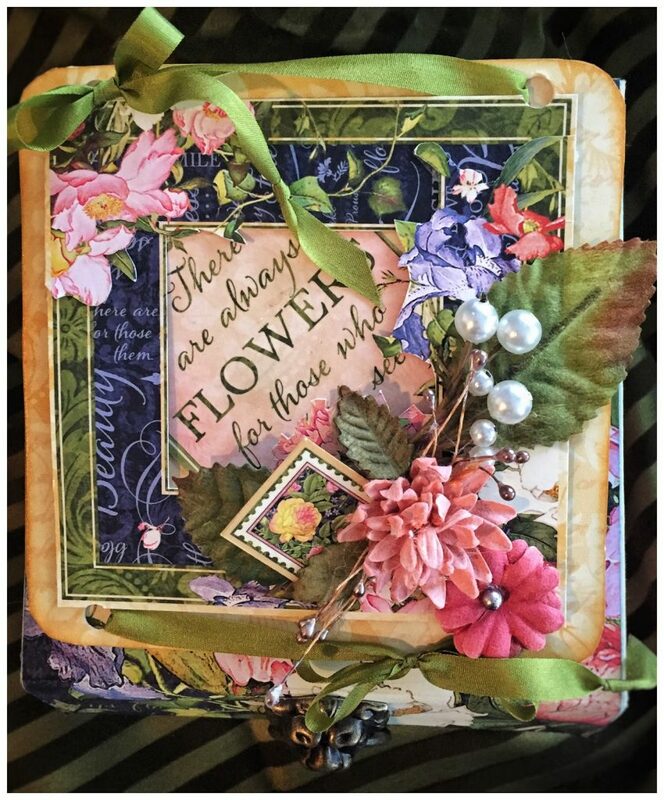 This class is packed with beautiful projects… a stunning double page layout, mini album AND a gift card holder. PLUS you’ll still have leftovers to create even more after class. Wow! These three projects showcase the elegant beauty of the Floral Shoppe collection perfectly, and offer great tips and techniques throughout. You will create a smashing double page layout, learn a simple binding technique that transforms Large Black Policy Envelopes into a fabulous staggered page mini album, and we’ll round things out by creating a quick and easy gift card holder suitable for any occasion. 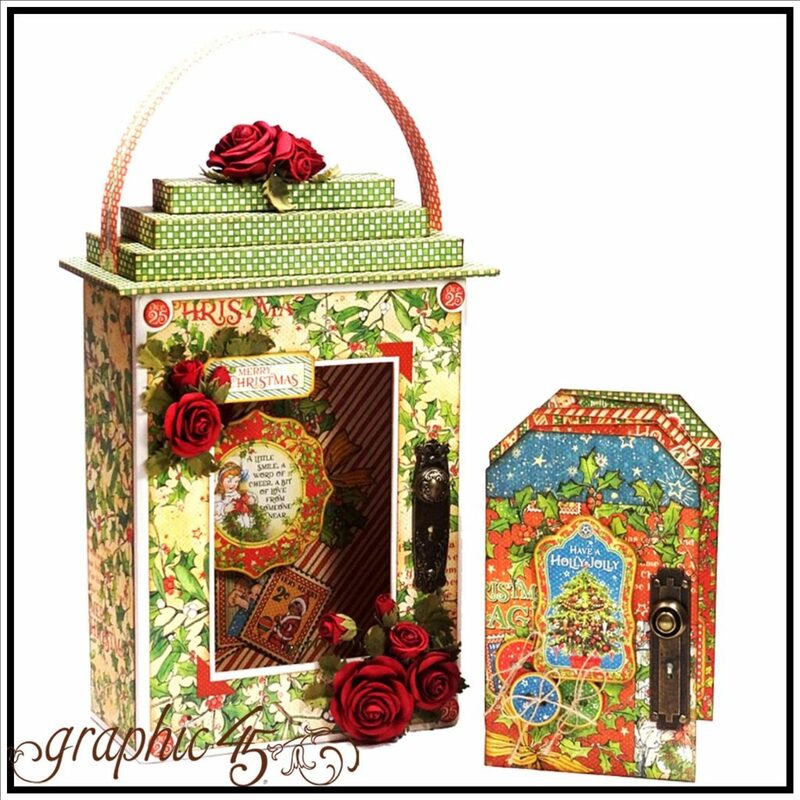 Your kit is LOADED with product, including: A full Floral Shoppe Collection pack (16 double-sided 12×12 patterned papers and a 12×12 sticker sheet), a full pack of Ephemera Cards, a 6×12 Chipboard Tag sheet, a pack of G45 Roses, a pack of G45 Large Policy Envelopes, a G45 Decades Ink Pad, cardstock & ribbon, plus full colour, detailed step-by-step instructions. 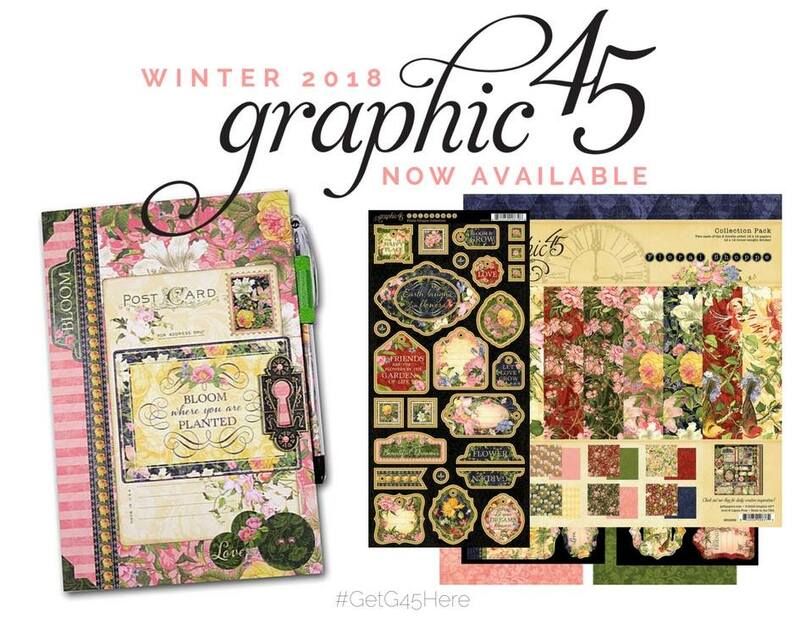 Come create with Graphic 45’s beautiful Botanical Tea collection! 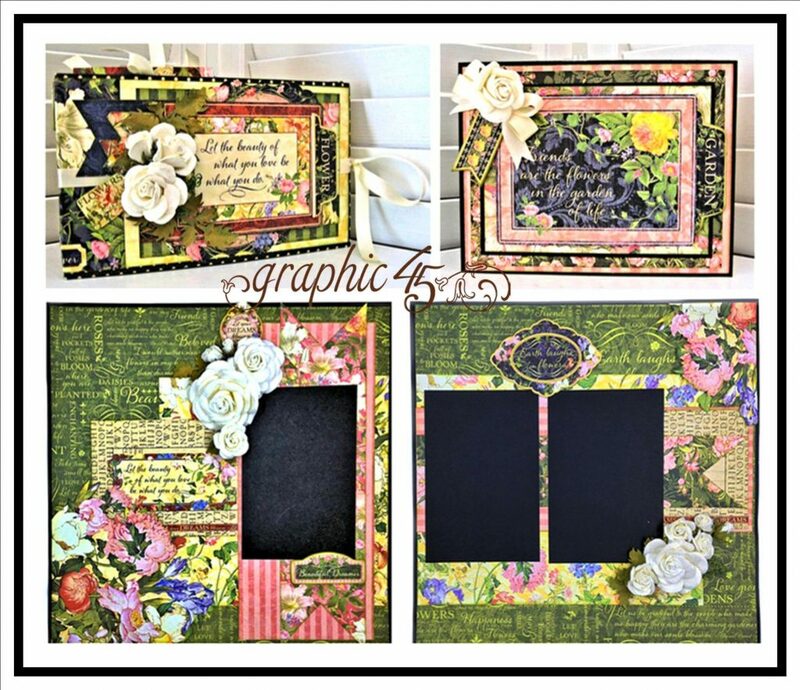 This class is packed with beautiful projects… a stunning magnetic closure card box, three easel cards, three coordinating envelopes AND a side-waterfall album. PLUS you’ll still have leftovers to create even more after class. Wow! 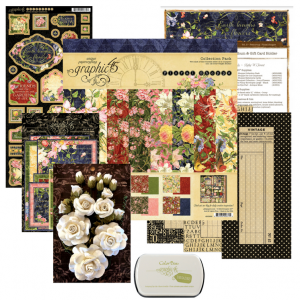 Your kit is LOADED with over $80 in product, including: A full Botanical Tea Deluxe Collectors Edition (24 double-sided 12×12 patterned papers, a 12×12 sticker sheet, and chipboard tag sheet), a kraft Mixed Media Box (5x5x2) with 6 cardstock mats, a full pack of G45 Shabby Chic Door Pulls, a G45 Decades Ink Pad, plus full colour, detailed step-by-step instructions. 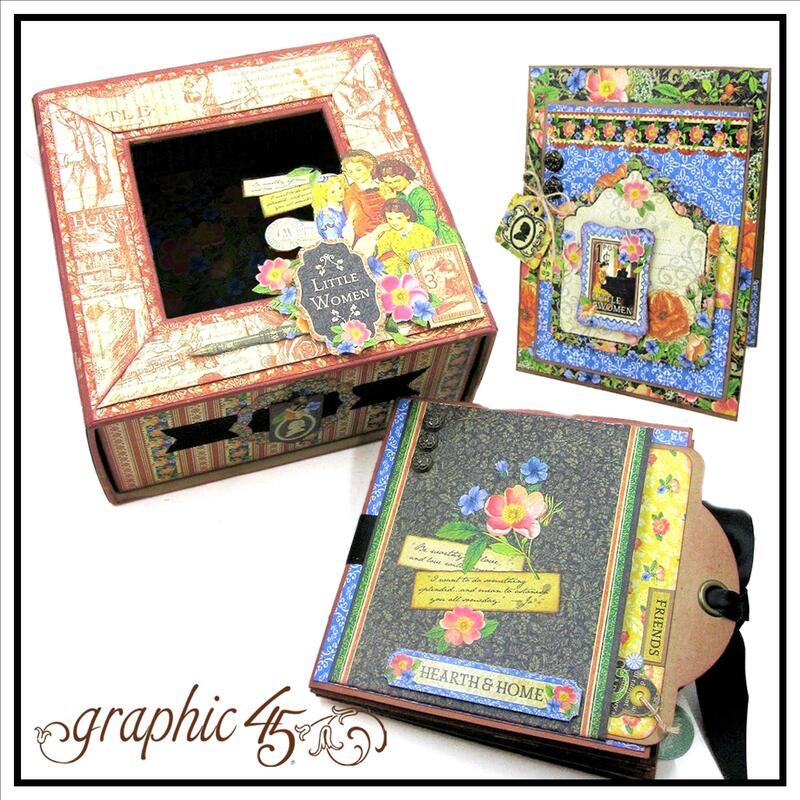 Come create with Graphic 45’s Little Women collection! Learn how to make an interactive folio album full of pockets & flips, pull outs, tags, photo & journaling spots, plus decorate a beautiful storage box & create a coordinating card, with TONS of extra product to create even more! This project features a Graphic 45 Deep Square Matchbook box, and we’ll be decorating it inside and out in classic Graphic 45 style with the Little Women collection. This would be a wonderful gift ~ either for someone special, or keep it for yourself! The box is 6.5″ square x 3.25″ deep and is perfectly sized as a storage drawer for the folio album. Note: The folio album will be created with ivory tags, not kraft as shown. Click here to see a short video & get a peek at the inside of the album! Your class kit is LOADED with over $80 in product, including: 24 double-sided 12×12 patterned papers, a 12×12 sticker sheet, a pack of diecut tags & pockets, a kraft Deep Square Matchbook box (6.5×6.5×3.25), an Ivory Square Tag album pack, a full pack of G45 Stamped Metal Brads, a G45 Decades Ink Pad, plus cardstock & ribbons and full colour, detailed step-by-step instructions. Introducing Botanical Tea, a G45 favorite paper collection that will warm your heart and soothe your soul. Sterling silver tea sets exude vintage elegance as butterflies dance amid blooming roses and unraveling ferns. The soft pastel color palette includes petal pinks, Cornelia blues, spring greens, satin creams and soft silvers. 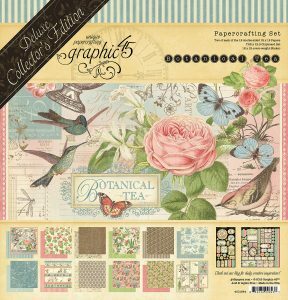 Infuse your crafts with pure elegance with Botanical Tea from Graphic 45! 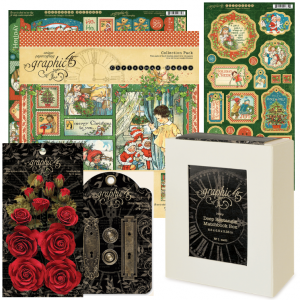 MORE new Graphic 45 goodies… a new album, and DIES… hooray! NEW: Floral Shoppe Collection Floral Shoppe is a beautiful collection that celebrates all things floral! This oasis of a collection offers four different floral designs offered in two different color palettes. You’ll love the rich greens, bright indigo, sunlit yellow, dramatic pinks, reds, and burgundy. This fresh collection is ready to be cut, trimmed, and arranged into a bouquet of fun projects, and we received ALL of it! Papers in 12×12 & 8×8, collection pack, chipboard, banners, ephemera cards & stickers… it is GORGEOUS! … and be sure to check out the G45 blog here for stunning ideas too! This collection is based on the beloved century-old novel about the lives of the four March sisters and their story of domesticity, work, and true love. The classic imagery will evoke memories of generations of women from the past and present. The rich color palette incorporates blush red, grassy green, vibrant yellow, and azure blue. We received the FULL collection! 8 double-sided papers, 12×12 collection pack, 8×8 paper pads, 12×12 Patterns & Solids pad, coordinating chipboard, cardstock tags & pockets, journaling & ephemera cards, and decorative cardstock stickers. See the full release and some AMAZING ideas here on the G45 blog… better yet, come in to see it and touch it in person! NEW: Sun Kissed Collection When there’s sun, sand, and sea, life’s a beach! This playful collection pulls together the deep ocean blues and complimentary coral, cantaloupe, and bursting sunny yellow for a freshly squeezed summer palette. Again, we received the FULL collection of this one too! 8 double-sided papers, collection pack, 8×8 pads, 12×12 Patterns & Solids pad, chipboard, tags & pockets, ephemera cards, and stickers. See the full release and some STUNNING ideas here on the G45 blog… better yet, come see it in the shoppe!